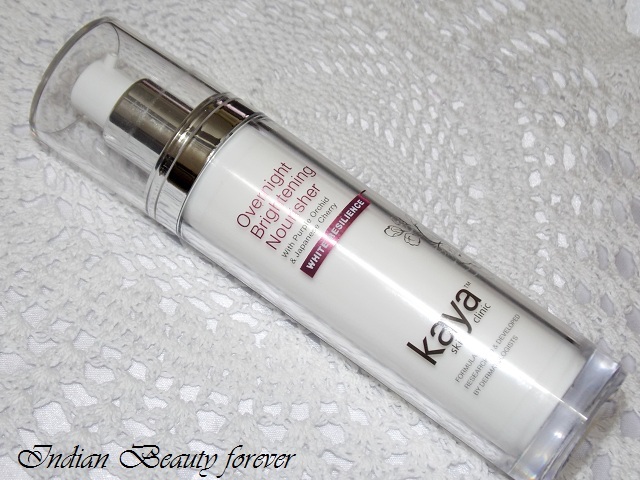 I will review Kaya Overnight BrighteningNourisher in this post. A good night cream, serum or lotion is an important step towards getting and maintaining a good skin. I got this product around a month ago and have used it a couple of times only since my mum uses this regularly. 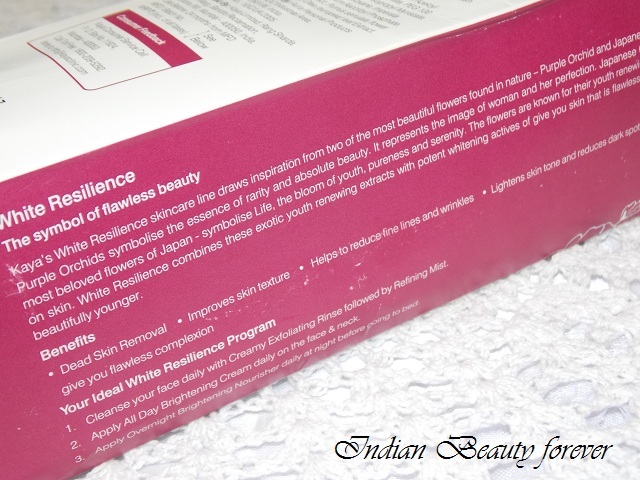 So, the review I have for you is based on her experience and my short brush up with this product. Views: The product comes in a pump pack and a packaging that looks luxurious, easy and hygienic to use. I find that the pump works fine and squirts out half a pea sized blob which is good as you can always take out more preventing unnecessary wastage of the product considering that it isn’t that cheap. All the Kaya products bear this safety seal that ensures that the pack you’ve got is unused. Very sturdy packaging makes it quite travel friendly too. The actual product has this plantish smell that is very mild and a texture that can be said as something in between of a serum and a lotion. It gets absorbed really well, since I have used this couple of times, I can say that, it has not made my skin greasy which is due to its light quick to get absorbed formula. Skin looks hydrated but not oily, good as a night cream/lotion. 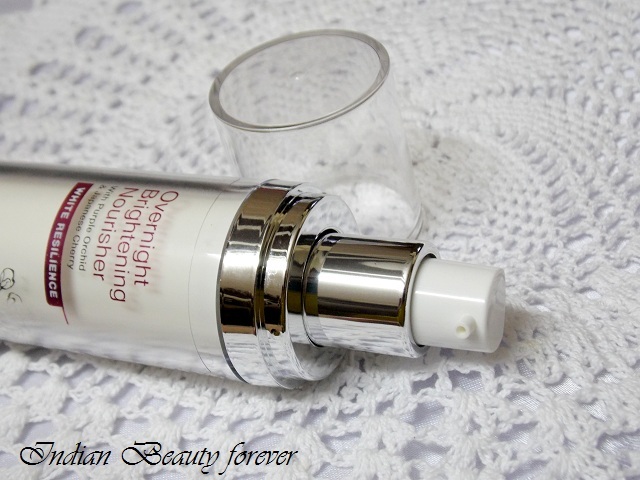 My skin is combination and thankfully this overnight brightening Nourisher has not break me out. To test the rest of its claims, I would like to share my mum’s views who has dry mature skin and have been using it regularly! Even though her skin is dry, she has not complaint that this Brightening Nourisher doesn’t give adequate moisture or her skin still feels thirsty for some extra moisture. It was quite capable of that. Therefore at least in summers it can moisture well. Moreover, hydration is one of the crucial things to look out for in a night cream/lotion, it shouldn’t matter what your skin type is. You might be thinking why am I not using this? I was actually using some other night cream and don’t like to change the products abruptly, therefore, when I realized that it has worked for her dry skin type and she needed a new night cream anyways, I asked her to test it. 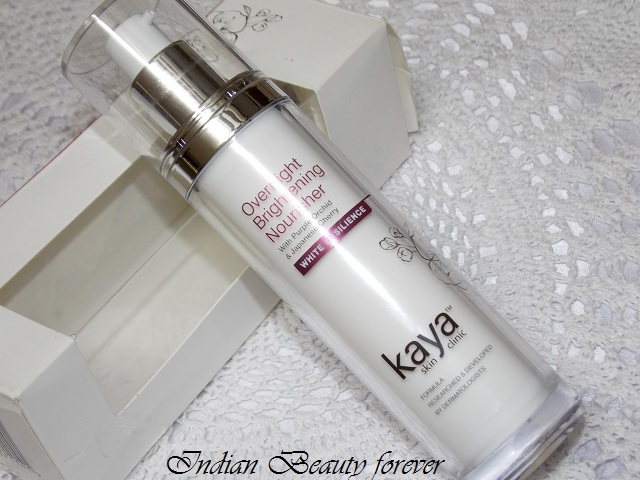 Take: Kaya Overnight Brightening Nourisher comes in a sturdy easy and hygienic to use packaging. Its serum like formula doesn’t make skin greasy or leaves the skin dry which makes it suitable for all skin types. It may not work as effectively on fine lines and spots but can make skin supple and bright with continuous usage. Skin looks radiant and glows. You can consider this as a good to include product in your night skin care regimen. PR Sample review is honest as always!! Sounds like a good product to get 4/5 stars. I have some problems with brightening skin products in that it breaks me out. Maybe this one won't.